This three-centre holiday is designed around fabulous walks amid varied and stunning land and seascapes, whist gaining an understanding of the rich cultural history. We will spend two nights on the Isle of Skye, three on Harris and two in Ullapool on the mainland's west coast. The drive from Inverness to Skye follows the north shore of Loch Ness and takes us through Glen Shiel which was once the scene of the Jacobite defeat on May 11, 1719. We will stop at Eilean Donan Castle, much photographed since its restoration during the 1920s. We spend one-and-a-half days walking on Skye before crossing the Little Minch to Harris. This Outer Hebridean island boasts a landscape of striking contrasts: rugged mountains to the north; white sandy beaches, turquoise ocean and flower-strewn machair on the southwest; rocky bays and lochans on the southeast. Here, at a crofter's cottage, we see the traditional weaving of Harris Tweed. 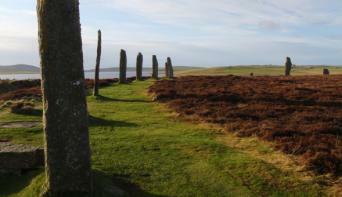 Travelling north across the narrow border into Lewis we visit the standing stones at Callanish. The 50 stones were erected at least 5000 years ago and the reasons for their alignment and relationship to three smaller stone circles and other monuments nearby remain a mystery. Finally, we cross the Minch to Ullapool on Loch Broom. This lively fishing village where whitewashed buildings curl around its harbour, has much to offer, including live traditional music in the local pubs. A walk in the Assynt area, a geologist's paradise north of Ullapool, promises a memorable conclusion to this unique Highland experience. Your North-West Frontiers guide collects you from Inverness at 1330 from the railway station. We will drive along the shores of Loch Ness and through beautiful Glen Shiel to the Isle of Skye. On the way, we have time to stop at the famous Eilean Donan Castle, which was originally built about 1220. Drive on to your accommodation in Portree. Today we travel to the southern part of Skye for our hike in the rugged Cuillin Mountains. 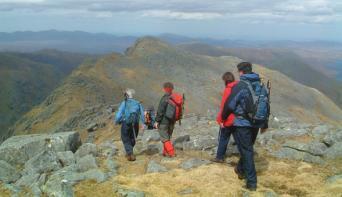 We’ll walk from Glen Brittle to Coire Lagan, a glacier-carved cirque in the heart of the range. You will be impressed by the exciting feel of the place. Whilst travelling around Skye and later Harris/Lewis, it is not unusual to hear snatches of the Scottish Gaelic, the indigenous language of the area. Gaelic culture and heritage still pervade the atmosphere. In the morning, we spend time in Trotternish, the north-east corner of Skye. 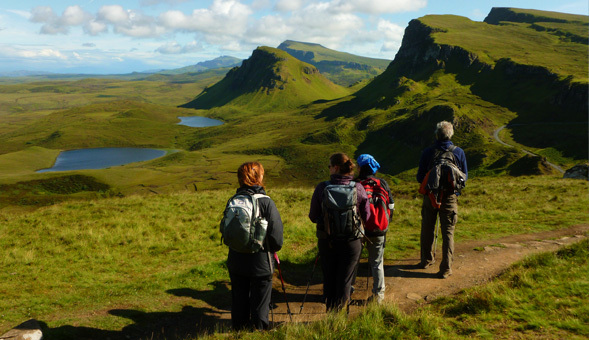 We walk to the Quiraing, a spectacular ‘forest’ of pinnacles and rock formations, from where we will enjoy dramatic views. We catch the afternoon ferry to Harris departing from Uig at 1400 and arriving in Tarbert at 1545. After settling in at the hotel, we go for a short walk not too far from Tarbert. Here, the oldest rock in Europe (800 million years), Lewisian gneiss, creates a unique landscape of hummocky hills and scattered lochans. Today’s walk starts from the tiny settlement of Rhenigidale on the east coast from where we will follow the old postman track to Tarbert. This is a great walk with wonderful views out along the coast and the surrounding hills. Later in the afternoon we go to see Harris Tweed woven in a crofter's cottage at Luskentyre on the wonderful west coast of Harris and we’ll have a contrasting walk along one of the many white beaches. The drive to the start of today’s walk is full of interest: we pass an old whaling station at Bunavoneader and the road runs past the door of Amhuinnsuidhe Castle (pronounced 'avin-suey'). It was built by the Earl of Dunmore in 1868, and has been bought by the local community. 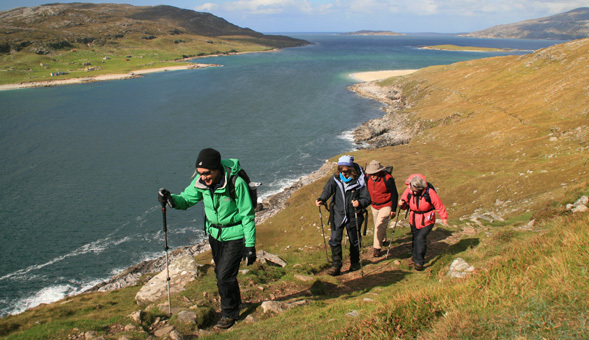 We follow the coastal path from Hushinish to the sandy beaches opposite the island of Scarp. 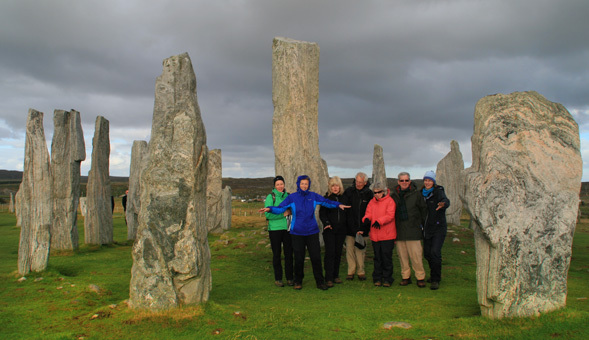 Today we will travel back to mainland but before we do we visit the megalithic (between 3000-1500 BC) standing stones at Callanish on the neighbouring Isle of Lewis. From Stornoway we catch the 1400 ferry for the crossing to the lovely west-coast fishing village of Ullapool. 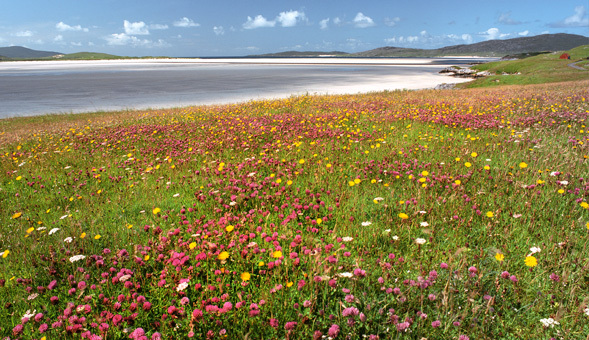 The 2½ hour ferry ride will offer us great views of the northwest coast and the Summer Isles. We drive through the rugged scenery of Assynt just north of Ullapool - a land of mountains, lochs, rocky headlands and rich plant & animal life. Also here we find Lewisian gneiss, creating a unique landscape of hummocky hills and scattered lochans, dominated by the individually shaped Assynt Mountains. We have a full day walk in this impressive area. This morning after breakfast we will return to Inverness. The drive takes about 1 hour and 15 minutes. We will be back at Inverness station around 10.30. This is in time to catch trains going south to Glasgow and Edinburgh. We spend two nights on the Isle of Skye, three on the Isle of Harris and, finally two in Ullapool. On Skye we usually stay in a quality guesthouse in the north of the island or hotel accommodation in the southern part of the island. On Harris we will stay at the quality family-run Harris Hotel. In Ullapool we will book rooms in a wonderful guesthouse in the centre of this lovely fishing village. Throughout your journey you can be sure of a friendly welcome and delicious meals. "Brilliant holiday enhanced by the care and attention by NWF for every aspect of the holiday. I have done a lot of trips with other companies but none of them matched your efforts to ensure a fantastic trip for all clients while showing off protecting the communities and places we visited." 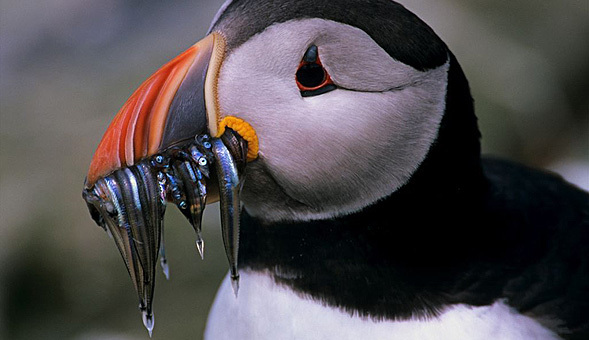 "Itinerary super, great taster of this part of Scotland. Delivered by a company that is passionate about what it does." "well priced, good value, well done!" "Very well organised and planned. Fantastic variety of walks"
The North-West Frontiers News Blog is packed with useful information and discussions. Catch up on the latest events. From the remote and wild mountains of the north such as Suilven and Quinag, to the dramatic coastlines of Orkney and Shetland. 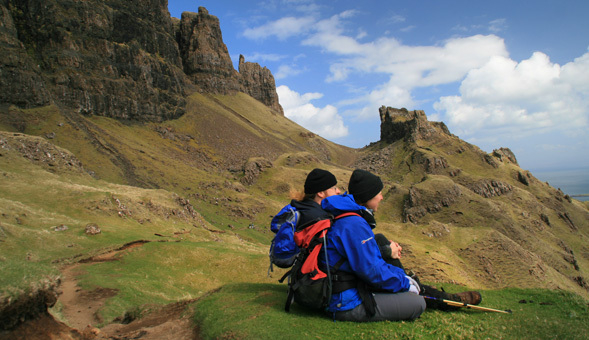 Our holidays will show you why Scotland offers some of the finest walking in the world. Exploring Scotland by open canoe is a truly memorable experience. Paddle below beautiful rocky mountains in wild glens or down flowing rivers. This environment offers the best chance to watch wildlife at close hand. Scotland has it all, wild remote rides in the mountains, great single track through forests of pine and rocky descents on old drove roads. Scotland will not disappoint in the quality of its riding and will leave you wanting more. Our range of self-guided holidays offers you the flexibility and freedom to enjoy the Scottish scenery at your own pace and in your own time. We take care of all the arrangements allowing you time to relax and explore. Our tailor-made service allows you maximum flexibility. You can choose from one of our imaginative itineraries or decide you want something completly different. Whatever your requirements we can help.